Today we only went from Lake Havasu to Parker which is about 47 miles so this will be a short post. We had a leisurely morning at Lake Havasu before we headed down the road. Stopping at 3 state parks on the way to Parker we are now up to using $62 of the $75 state park ticket that we got. I figured we will have gotten full use of it by tomorrow. Each of the parks was a little different even though they were all on the Colorado River. They all had campgrounds and day use areas and everything was pristine and groomed. Very different than our parks where things are more natural. Rob saw a huge fish jump at one park and he said it was the biggest he’s ever seen. 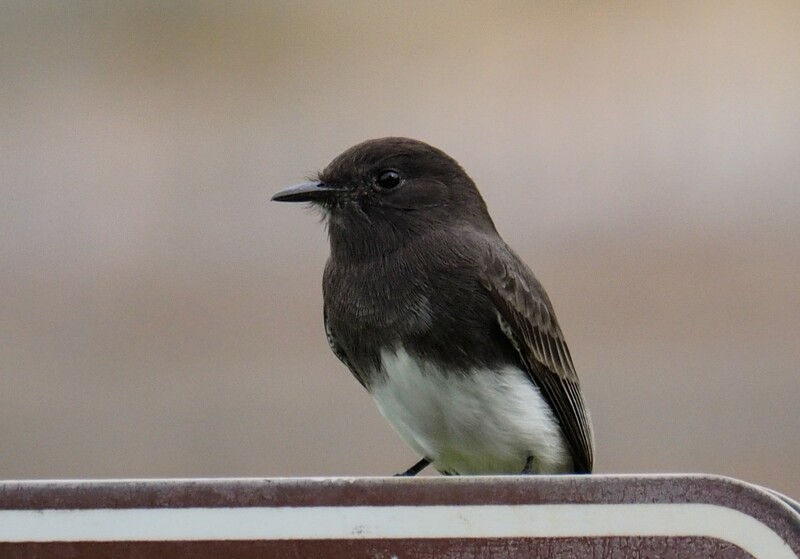 I got some good pictures of a black phoebe that was hawking for insects along the water and he’s sitting on a sign. 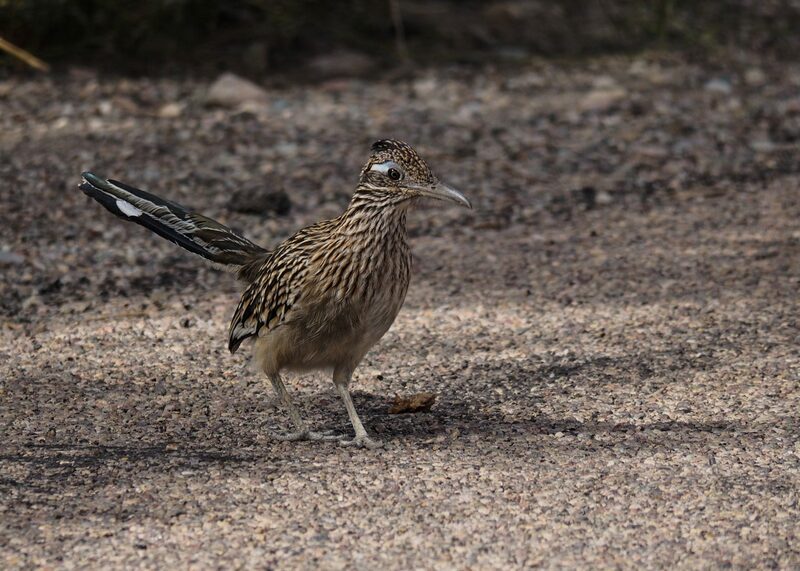 Also, you are going to get one more roadrunner picture. We stopped at a Goodwill today looking for a shirt for Rob with snaps but where we stopped was just a drop-off centre. Going around the building, I looked out my window and saw a bird crouched on the edge of the road. Backing up to see it more clearly and there it was… a roadrunner. Amazingly it just sat there. So I took a bunch of pictures and then Rob got out of the car and it still stayed there. He got talking to the people in the building and it appears they feed it hamburgers so it’s not skittish of people. Rob got so close he could have almost petted it. I did some reading on them and they actually have two toes facing forward and two toes heading backwards. They eat all sorts of small mammals and reptiles even poisonous ones with no ill effects. If they kill a snake that is too large to fit in their stomach, they will run around with part of it hanging out of its mouth until the part in the stomach get digested then they will swallow a little more. Too much information…? Arrived in Parker around 4 pm and got a hotel along the water. Nice and quiet being off the main drag and we can sleep with the window open. Planning on having a great sleep tonight.